Amine Linganzi has joined Swindon Town after his Pompey hopes were dashed. The 27-year-old yesterday told The News Kenny Jackett had not offered him a new Blues deal. 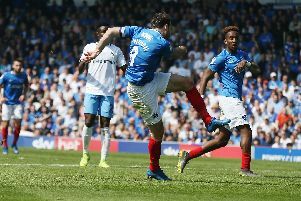 Linganzi moved to Fratton Park last season and made 23 appearances in Pompey’s League Two title-winning campaign and scored one goal. The central midfielder wanted to remain at the Blues but was deemed surplus to requirements by new boss Jackett. He joins Swindon subject to a English Football League and Football Association approval.